It's time to fall in love with greens and grains, in salad form. I'm excited to share this recipe with you because it's what I'm eating all the time. Super-real life eating! We all know the importance of greens by now, but it's also important to get our whole grains/complex carbs in everyday. A salad like this is an easy, delicious way to do it, and the options are endless: Pick a green and a grain and then add your favorite vegetables, fruits, and nuts. Beans are a good addition here, too! This version I particularly love because all of the flavors just jive together. Bitter kale and caramelized roasted sweet potatoes are a perfect pair - throw in some apples and walnuts for crispness and crunch and tie it all together with a tangy bacon-balsamic vinaigrette. And if you've never had barley, you're in for a treat. One of my friends who tried this had never had it before, and she fell in love - it has a toothsome quality, and it feels much heartier than quinoa or brown rice. I know a lot of you like to rock out salads in the summer, but this is the move in the fall and winter - when you need something more satisfying. Tangy balsamic-bacon vinaigrette is one easy way to get them to eat their greens and grains, don't you think? Vegetarians can opt for straight olive oil instead. Bring barley and 2-1/2 cups salted water to boil. Lower heat to simmer, cover, and cook about 40 minutes, stirring occasionally, until water is absorbed. Preheat oven to 425 degrees F. Toss sweet potatoes with thyme, olive oil, 1/2 teaspoon kosher salt, and a sprinkling of pepper. Spread onto a baking sheet in an even layer and roast 30 to 35 minutes, turning once halfway through cooking. To make the vinaigrette, cook bacon until crisp. Remove using a slotted spoon; pour off all but 2 tablespoons of the bacon fat. Add shallots and cook until softened. Transfer to a small bowl and stir in vinegar, lemon juice, Dijon; slowly whisk in olive oil. Season with salt and pepper to taste. 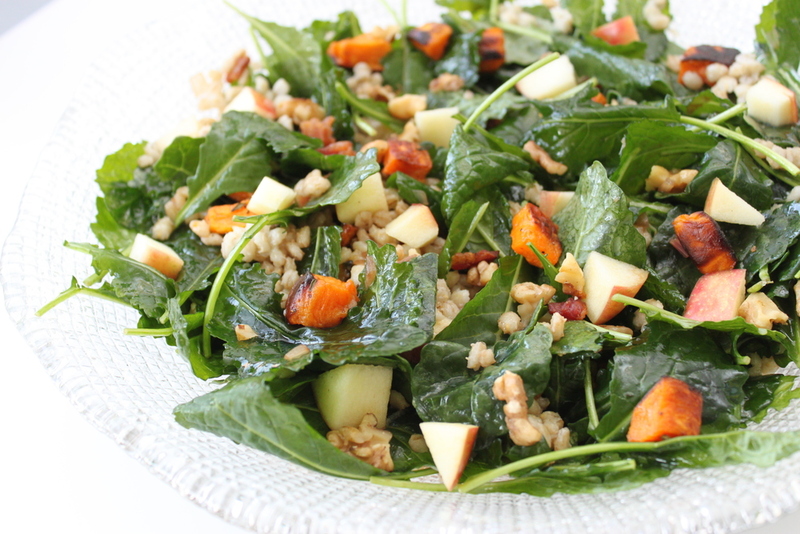 Toss barley and kale together in a large serving bowl with half of the vinaigrette; fold in sweet potatoes, apple, and walnuts. Taste for seasoning, adding salt and pepper if necessary, and serve with remaining vinaigrette.